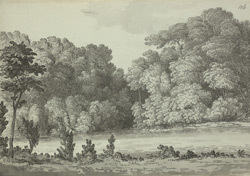 A view in ink of the creek in the river Wear at Butterby Springs, near Durham. It shows two springs: the first was known as the Sweet Well, and supplied fresh water; the other was known as the Stinking Well, as it smelled and tasted somewhat sulphurous. The flow of water to the springs is supposed to have been disturbed by mining in the late 19th century, and the wells are no longer the attraction they were when Grimm made his drawing.